It wasn`t going to be just a partying weekend. 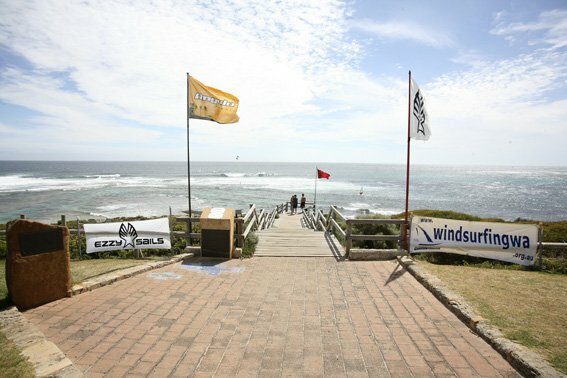 WA wavesailors were expecting some serious Margaret River conditions and the organisers knew they wouldn`t make an appearance for anything less than the typical conditions Margies can turn on. So with the wind forecast looking doubtful for Friday and westerlies forecast for Saturday and Sunday the organisers had little choice but to postpone the comp. It was a different story however on Friday 2 weeks later on 23 February 2007. To ensure a result in all divisions a expression session format was to be used, which allowed more sailing time for all wavesailors, less judging effort, and results in one afternoon. The postponement must have had an effect on attendance as numbers were down to 18 this year. 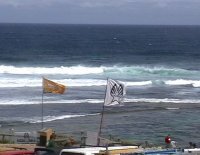 A south easterly had been blowing all morning and surfers were revelling in the 3m+ wave faces. 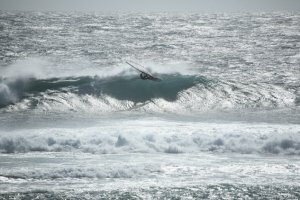 As the breeze picked up and swung more southerly, local sailor Simon Peters headed out to check the conditions. Within minutes he was joined by a dozen other competitors, warming up for the competition start. Things then got underway with the Open division sent out for an all in 40 minute expression session. Sailing conditions in the south-easterly were difficult for some, the breeze was very light on the inside, but much stronger outside the break. Robert Van Der Vlies (Ezzy Sails) and Serge Pillonel got straight into a big set close to mast high, with Robert pulling off a goiter at the end of his ride. Stephano was swallowed by the white water and 15 year old Niels had a long swim after wiping out on a big one. The wipeouts didn`t deter anyone though, with Niels getting back onto the next big set and riding his wave all the way to the inside. Robert showed his airborne skills with a wide range of jumps, loops and spins. All sailors had plenty of great wave rides. The Elite division hit the water next. 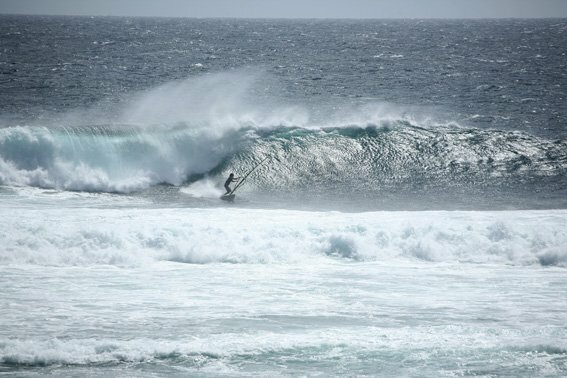 Simon Peters got straight onto the first wave of a big set, charged down the line to launch a huge trademark aerial, then back up onto the face again. This set the challenge for Ben and Eric who matched each other wave for wave. Eric`s cleaning wave riding, finishing with a spin, goyta, grubby, or spock and loops on the way back out put him in a good position. Simon came a cropper and snapped his mast only 10 minutes into the heat. Ben was really going for it, several 360 attempts and gutsy moves on the biggest waves ended in wipeouts, however he soon had it sorted, pulling off a wave 360, great wave rides, high push loop, forwards, back loops and a couple of Flakas. Meanwhile Galvo was concentrating on his wave riding, exploding off the lip with his powerful style. There was so much happening at once it was a difficult job for the judges. Lastly the Masters and Youth division took their turn. Galvo, having had a good warm up in the Elite was still in fine form and picked up many great wave rides. Silvio and Serge took it right up to him with an excellent display of waveriding. Niels van Toor in the Youth division continued to show his greatly improved form and fearless waveriding. All turned up on Saturday afternoon after a great night at the corner pub, hoping for a repeat performance to Friday but sadly the wind was offshore all day. 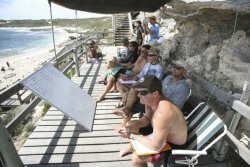 Presentations were held at Surfer`s Point over looking the break. Hand made trophies were handed out to first place in each division, and place getters received either a cash prize or a voucher from the sponsors Ezzy Sails, Angulo and [org]. All agreed it was a great event and look forward to the 2008 event. Thanks to John Grulich from WWA for organising the comp. and to Fiona Court as head judge. Special thanks to Mark Taylor of [org] for sponsoring the event.